The FD-1200 AutoSeal offers a user-friendly low-volume solution for processing one-piece pressure-sensitive mailers. 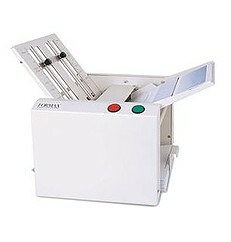 This low volume pressure sealer combined with a laser printer and pressure seal forms, creates secure, mail-ready pieces. The clearly marked fold plates and drop-in feed system provides an easy set-up and operation, right out of the box. With a compact desktop design and processing speed of up to 35 forms per minute, the FD-1200 is ideal for an office environment with low volume applications. With features including the ability to process 14” forms, an integrated catch tray which enables operators to complete daily processing jobs with ease, and pre-marked popular folds which makes changing fold types or form size quick and easy. The FD-1200 features a drop-in feed system which produces dependable feeding of forms with no fanning required with the ability to make common folds. Built with proven Formax technology, the FD-1200 is an economical solution with the quality and reliability you have come to expect from Formax. If you have any questions or are interested in purchasing the FD-1200 Low Volume Pressure Sealer, visit us at SpiralBinding.com. We have great pricing on a full line of Pressure Sealers. Call us at 1-800-631-3572 for more information!